Digital forensic involves integrating computer science with laws that are needed to investigate crime. It involves complete recovery and then interpretation of data present in digital devices to be presented in law courts and mostly involves cyber crime. Investigation in digital forensics is carried out in three stages which includes exhibit acquisition, investigation and analysis along with reporting of crime. Forensic technology has become an important component of financial investigations which includes contentious, non-contentious, and fraud-related litigation. Forensic technology experts use various forensic technology tools to gather evidence and make a strong case against criminals. The global digital forensics market stood at a valuation of US$2.87 bn in 2016 and is estimated to be worth US$6.65 bn by 2025, rising at a CAGR of 9.7% from 2017 and 2025. Today, cyber criminals are causing unprecedented damage using simple IT tools or cloud services. They leak confidential consumer information or valuable business information by hacking personal files of individuals or organizations that leads to disruption in functioning. This requires evidence-based investigation for information recovery, thereby driving the digital forensics market. Moreover, the increasing trend of cloud-based solutions and Internet of Things technology has increased the risk of malware and virus, further putting confidential information at risk acting as another key driver for this market. The use of multiple channels leading to the growth of sophisticated crime, especially for hacking organizational information that is related to IT applications has further pushed the growth of this market. However, rising use of mobile devices and their growing complexities are posing a challenge to the growth of this market. This is because retrieving information from certain devices is a herculean task, which makes it difficult to reach to the real culprit in case of cybercrimes. Governments have also raised concerns regarding the accessibility of mobile platforms of certain companies further posing a challenge to the market’s growth. Nevertheless, the increasing relevance of digital evidence to expose criminals is expected to extend growth opportunities to the digital forensics market. In terms of type, the digital forensics market is classified into computer forensics, database forensics, cloud forensics, network forensics, mobile device forensics, and others. In 2016, the market was led by computer forensics followed by mobile device forensics. By application, healthcare, banking, financial services and insurance (BFSI), law enforcement, information technology, education, defense and aerospace, transportation and logistics, and other are the segments into which the digital forensics market is divided. Law enforcement and defense and aerospace are the leading application segments in the market. On the basis of geography, the global market for digital forensics is segmented into North America, Asia Pacific, Europe, Latin America, and the Middle East and Africa. In 2016, North America trailed by Europe stood as the key regional segments of the market. Asia Pacific holds substantial revenue in the global digital forensics market. The increasing trend of cloud based solutions and internet of things technology in these regions is acting as the major growth driver in these regions. In addition, increasing growth of well-planned sophisticated cybercrimes and malware that has risked the confidentiality of intelligence data in many nations in these regions is also a key factor driving the digital forensics market. Some of the key companies in the digital forensics market include AccessData Group LLC, FireEye Inc., Paraben Corporation, CISCO, Guidance Software Inc., LogRhythm Inc., Micro Systemation AB, NUIX, Binary Intelligence LLC, and IBM Corporation among others. In-depth analysis of the global digital forensics market has been considered under the scope of this report, for the forecast period of2017 to 2025. The scope of this report includes competitive analysis of various market segments based on the types and applications. Digital forensics is mostly used for collection, identification, extraction and analyze various evidence from computers, hard disks, mobiles, laptops and other digital devices. This technology is implemented in civil and criminal court cases along with different other private organizations for internal investigations. Moreover, digital forensics has become a key asset in addressing employee theft, particularly in banking, defense, and IT industries. In addition, these devices are used for mobile data recovery and crimes related to cloud computing. With the continuous advancements in forensic technology, investigators are able to collect and analyze clear and accurate data across multiple devices. Digital evidence is extremely volatile However these tools has been used to recover trace and investigate what may have led to an incident for retrieving lost data and gather evidence for use by an entity or to defend the organization or an individual. The global digital forensics market has been segmented on the basis of types and industry uses. A cross sectional study of the global digital forensics market across four major geographical segments has also been covered under the purview of the report. Growing cyber-crimes coupled with rising safety concern have led to a rise in the implementation of digital forensic tools in various industries. Digital forensic technology plays an integral role in preventing internet related crimes and misuse of company data. Moreover, cyber-crime is accelerating at an alarming rate and digital forensics acts as an essential element that has the power to encumber the progress of such criminals. Due to rise in security concerns in different verticals, such as defense, banking, health care, information technology, law enforcement, education, and logistics, among others, the market for digital forensics is witnessing substantial growth currently. In addition, due to rapid advancements in forensic technology, such as the ability to recover complex data from electronic devices, fingerprint recovery from metals, and DNA profiling, prices of forensic tools have reduced, which in turn has increased the affordability of forensic applications along with their market penetration. Today, virtually all organizations rely on mobile devices to do their business. This has resulted in more mobile-specific vulnerabilities that have manifested malware and network-based attacks to expose enterprise data. The complex mobile functionalities have been a major restraint for this market providing different challenges towards its growth. Another important issue in the field of digital forensics would be the lack of regulation as well as professional or standards in governing practitioners. Those involved with determination of the relevant digital evidence are sometimes not equipped enough for make these assessments. It is the growing importance of digital evidence that is expected to provide various opportunities for this market. The global digital forensics market on the basis of different types has been segmented into computer forensics, network forensics, cloud forensics, mobile device forensics and database forensics and others. Healthcare, education, banking, financial Services, and insurance (BFSI), defense and aerospace, law enforcement, transportation and logistics, and information technology and others are the various application segments on the basis of which this market is segmented. Regions that are considered under this report comprises of North America, Asia Pacific, Europe, Middle East, Africa and Latin America. Revenue has been provided in USD billion for this market along with the CAGR for the forecast period of 2017 to 2025. This market research study on the global digital forensics market provides estimation in terms of revenue (USD Billion) from 2016 to 2025. It identifies the various drivers and restraints affecting the industry further analyzing its impact over the forecasted period. Moreover, this report also recognizes the significant opportunities for market growth in the years to come. 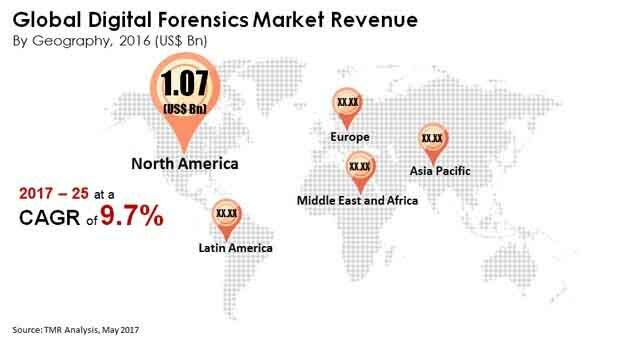 The competitive profiling of the major players in the global digital forensics market and their market shares across the five broad geographic regions namely, North America, Europe, Asia Pacific, Middle East and Africa and Latin America have been incorporated in this report. Furthermore, key business strategies adopted by the leading players have been included in this report along with the competitive analysis and market attractiveness analysis showing the major trends for this market from 2017-2025. Some of the leading players in the global digital forensics market are Guidance Software Inc. (The U.S.), AccessData Group LLC (The U.S.), LogRhythm, Inc. (The U.S.), FireEye Inc. (The U.S.), Micro Systemation AB (Sweden), Paraben Corporation (The U.S.), NUIX (Australia), CISCO (The U.S.), Binary Intelligence LLC (The U.S.) and IBM Corporation (The U.S.) among others.